Lunch doesn’t have to be boring and it damn sure shouldn’t be expensive, baller account or not! Well, maybe sometimes lol. 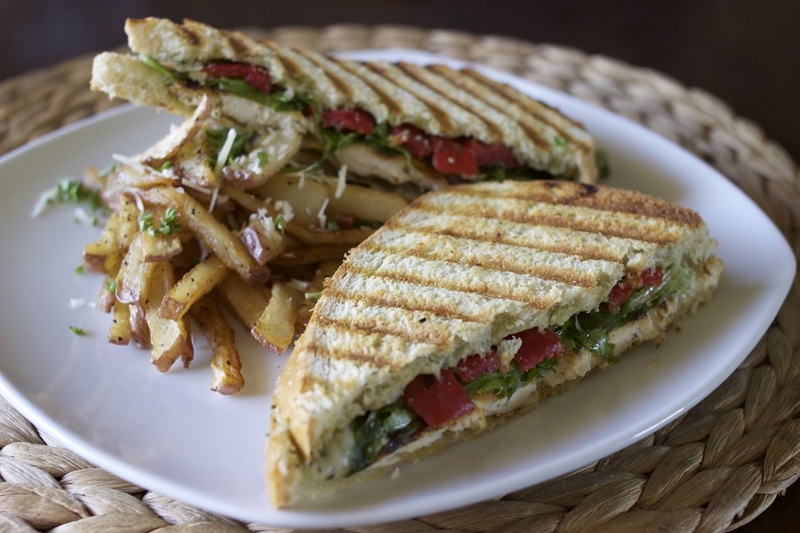 I have this special place in my heart for pesto. It’s so rich and it goes great on almost anything. Just that these last couple of days (not complaining) have been a little warm, and let’s be honest, no one wants to be sweating in March, its barely spring! 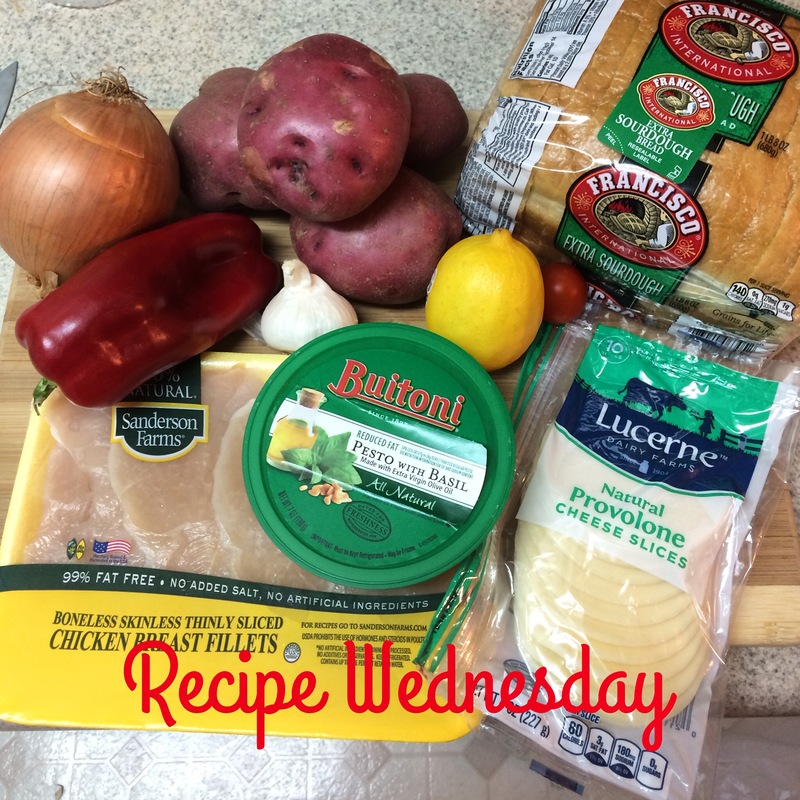 So this simple, quick and fun recipe is perfect for our mini spring heat wave. Let’s dive right in! 1. First preheat your frying pan to medium high heat to cook/ fry your fries. TIP: Fries end up crispier when you drop them in oil that is really hot, it avoids mush. 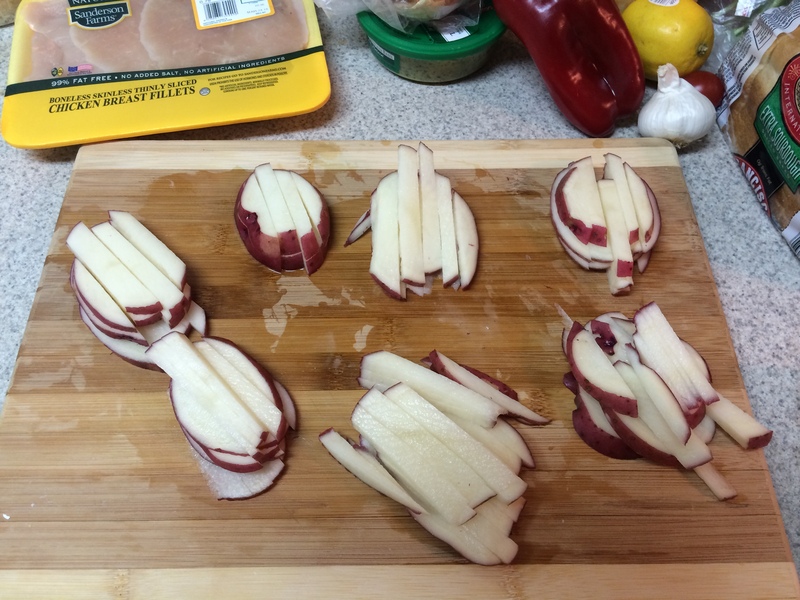 While you are heating the oil cut your potatoes into rounds and then cut them into “sticks”. I used EVOO. You can also bake them at 350 with a light brush of EVOO and a few rotations for 25 min. 2. Once your oil it hot, drop them in and sprinkle on some salt and pepper. Now you can cut your bell peppers that we will grill/ roast. Always remember to cut your veggies before you handle meat. 3. 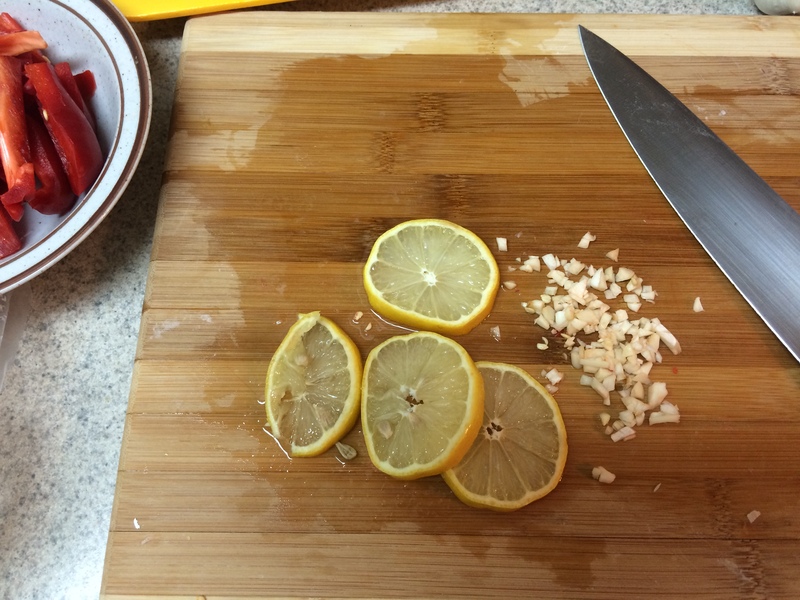 Now mince your garlic and cut your lemons into wheels. 4. 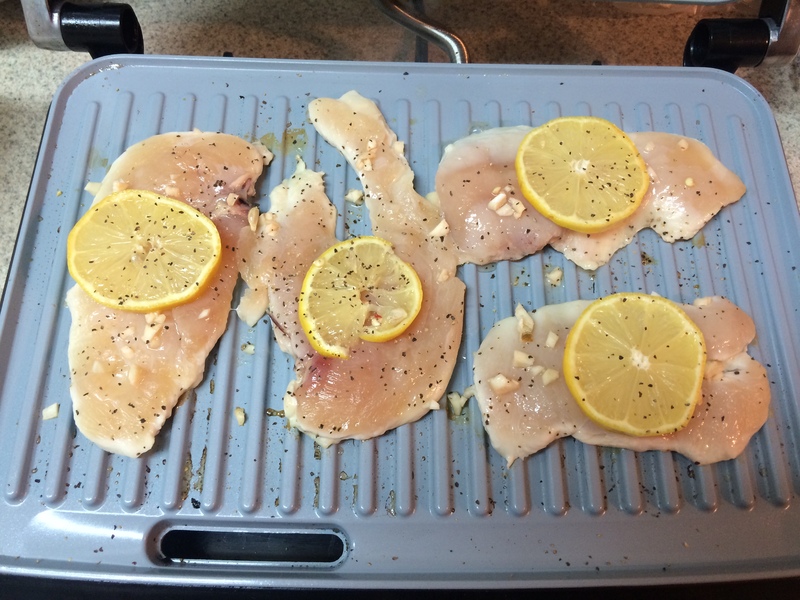 On a panini grill place your chicken the garlic and lemon wheels to grill and cook. This is a great time to check/ turn over your fries. They should be getting crispy by now. 5. 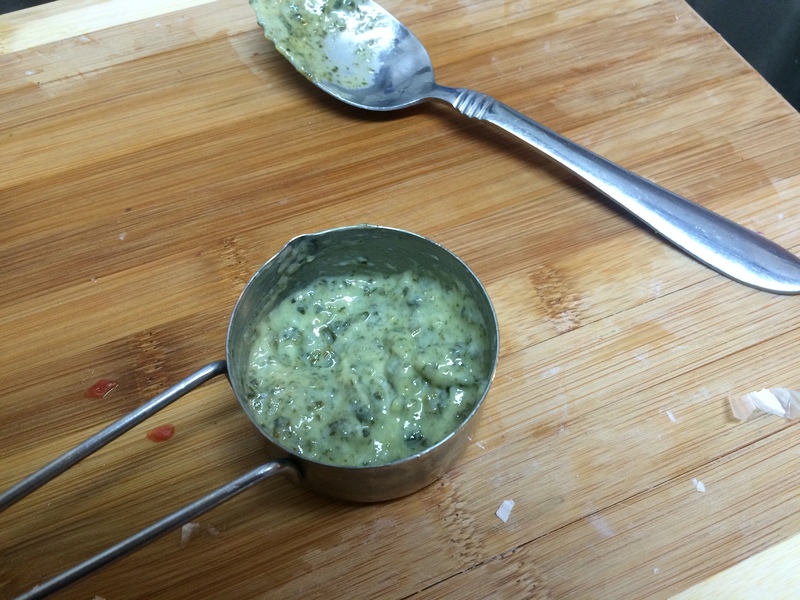 Now were making the pesto-mayo to cover our bread and make the flavor punch that makes the sandwich fun! 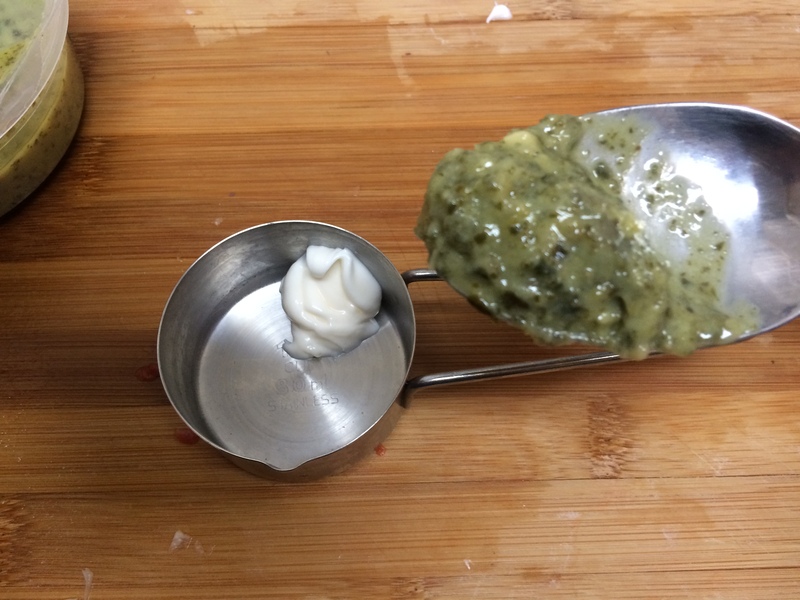 Equal parts mayo and pesto sauce. See, easy! 6. 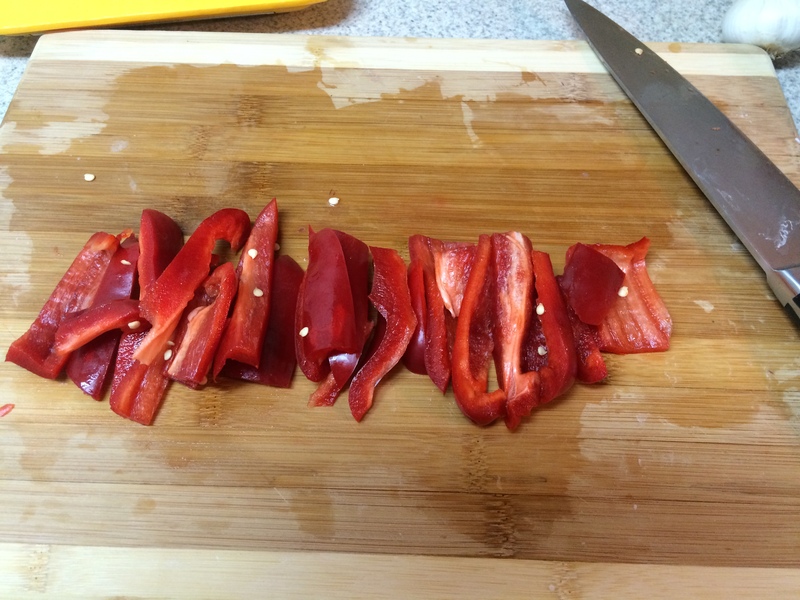 Now your chicken should be done and after it is you should begin grilling your red peppers. This should only take about 3-4 minutes and in this time you want to get ready to prep all of your sandwich ingredients. BTW your fries should be all the way done. 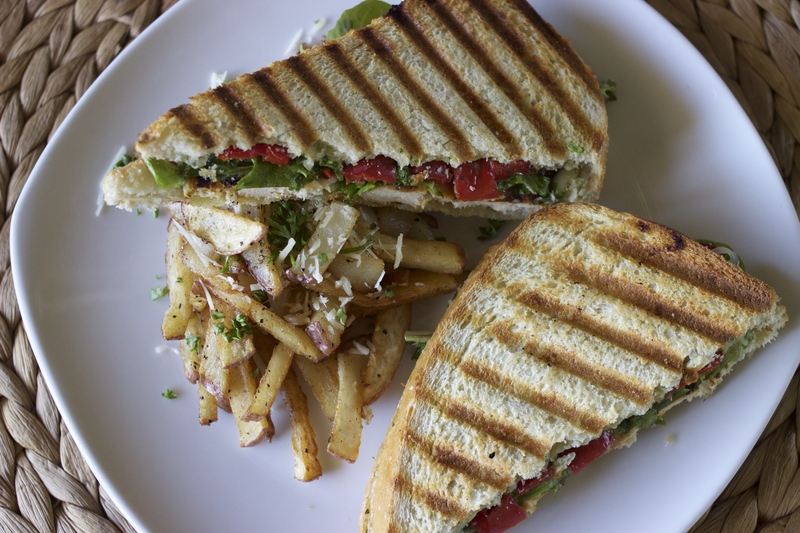 take them out and put them over a paper napkin to remove excess oil. 7. 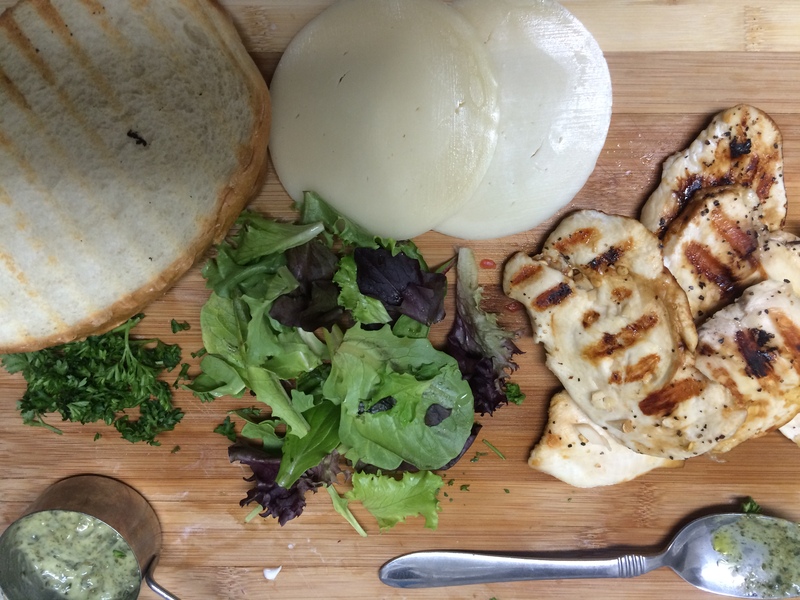 Now you can begin to plate your lunch/ dinner! 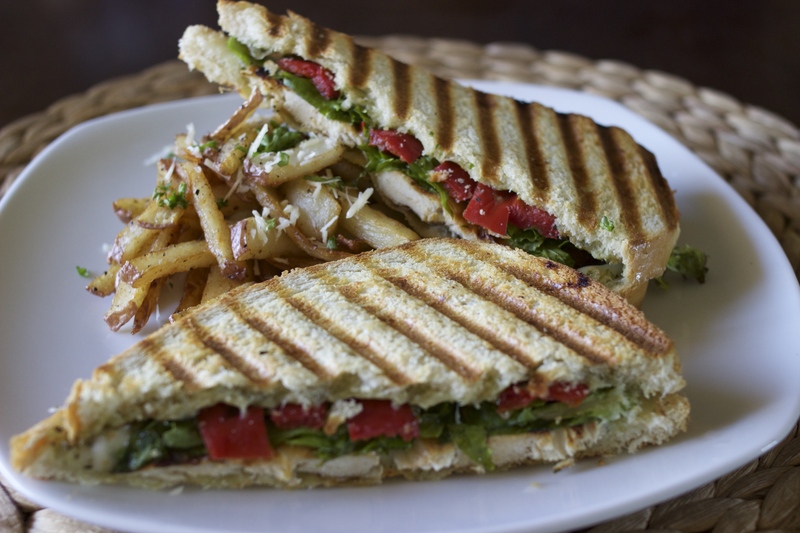 build your sandwich entirely and place it under the panini grill to melt your cheese and fuse the flavors together. 3 minutes max. 8. 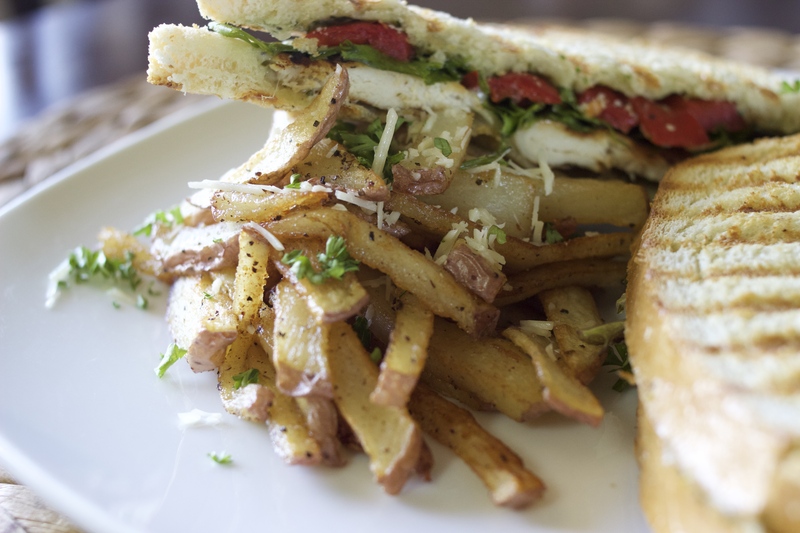 Grab a handful of fries while they’re hot and sprinkle some parmesan cheese and chopped parsley. Then viola!